You can grow up to be anything you want to be – and now so can your emoji. Google unveiled a slew of female emoji characters Thursday that the tech giant says are designed to promote gender equality. They depict women with an array of skin tones in various professional careers, including rock star, doctor and welder emoji. 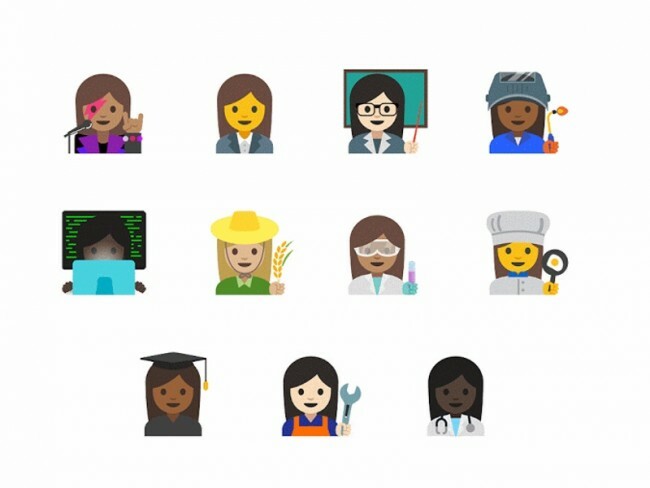 “While there’s a huge range of emoji, there aren’t a lot that highlight the diversity of women’s careers, or empower young girls,” Google wrote on its official blog. “These new emoji are one of several efforts we’re making to better represent women in technology, and to connect girls with the education and resources they need to pursue careers” in science, technology, engineering and mathematics, the company wrote. The company has also added male and female versions of 33 existing emoji. For example, you can now use the female weightlifter, cyclist or surfer emoji when communicating with friends about your weekend plans. The tiny icons have been surprisingly political since you could first start texting them to friends. With characters that were largely white and adhered to stereotypical gender norms, many thought the options did not accurately reflect the entire population of smartphone users. Google’s new emoji will be included in future versions of the Android mobile operating system.